Florida’s Amendment 4 – which voters overwhelmingly passed to restore the eligibility to vote to 1.4 million people with a past felony conviction — is in danger. 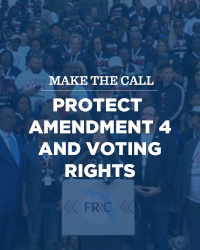 On Tuesday, the House Criminal Justice Subcommittee in the Florida Legislature passed a bill that could impact full implementation of Amendment 4, narrowing the language of those eligible to register to vote. The Senate Criminal Justice Subcommittee is voting on the bill next Monday, March 25, and we need all hands on deck to ensure that the voters are heard! Two out of the three Republicans on the committee actively supported Amendment 4 — meaning this is a key moment to stop this legislative overreach — and we want to put in kind, but strong calls into their offices. Among other damaging things, this bill redefines certain crimes and seeks to deny voting eligibility to people who have served their time but have not paid certain fines or other fees, beyond the fines and fees given by the judge during sentencing. This overreach also seeks to expand the definition of completion of sentence beyond what was previously established by the Clemency Board. Call the state senators above immediately and demand they reject this bill that will massively reduce the number of Floridians able to register to vote. Amendment 4 was passed with widespread support, and we can’t let the Florida Legislature thwart the will of the voters and undermine the history we made together. Mark and the Progress Florida team. PS: Here’s a great editorial in the Orlando Sentinel on the attack on Amendment 4: “The Unfolding Attack on Amendment 4 and Voting Rights”.